ANA: Curb Your Sweet Tooth Challenge - Begins May 21! We know overdoing it with sugar is bad for our health. 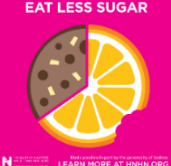 Excess sugar consumption can lead to obesity, cardiovascular disease, tooth decay, and type 2 diabetes, but we still eat more of it than we should. Sign up for the 10 day Curb Your Sweet Tooth challenge to learn some simple ways to decrease your sugar intake.